Thanks as ever to Rochelle for guiding us towards another challenge and to Adam for his great photo this week. Today would have been my father’s 90th birthday. Due to the date, he has been in and out of my mind all day, when I saw the prompt this week, I knew I had to write about him and so I crave your indulgence. Some weekends he would take off on his motorbike, heading for the Lake District and the hills he had roamed since boyhood. He knew the places untouched by tourism, and would lose himself in the majestic beauty of the scenery; whatever worries he took with him, vanished into the clean, fresh, air. After the accident, his motorbike was sold. He was 58 and my mother judged him too old to be in charge of such a powerful machine. He died at 67; we scattered his ashes into the wind on Scafell Pike. I’m sure I heard him laughing. Thank you Janet glad you liked it. Another FF story – you’re probably right! Thank you kz. I think he would have approved. Lovely story Dee, and a lovely tribute to your Dad. Beautifully done. Funnily enough, the prompt made me think of my father. When my father died, I had to bring his belongings back from the hospital. There is nothing more poignant, I think, than seeing a pair of shoes that had been worn on the way into the hospital and that now would be worn no more. Thank you Sandra, glad you liked it and understood. To leave hospital with your father’s belongings but without him, must have been very upsetting. My father died at home, in his sleep, no time to say goodbye. It’s a good thing we don’t know what the future holds for us. A deeply touching story, very similar to mine… which was fiction. I saw those boots and was inspired the same way. I’m so sorry for the early loss of your father, and love the tender way you tell part of his story. Nice job, Dee! 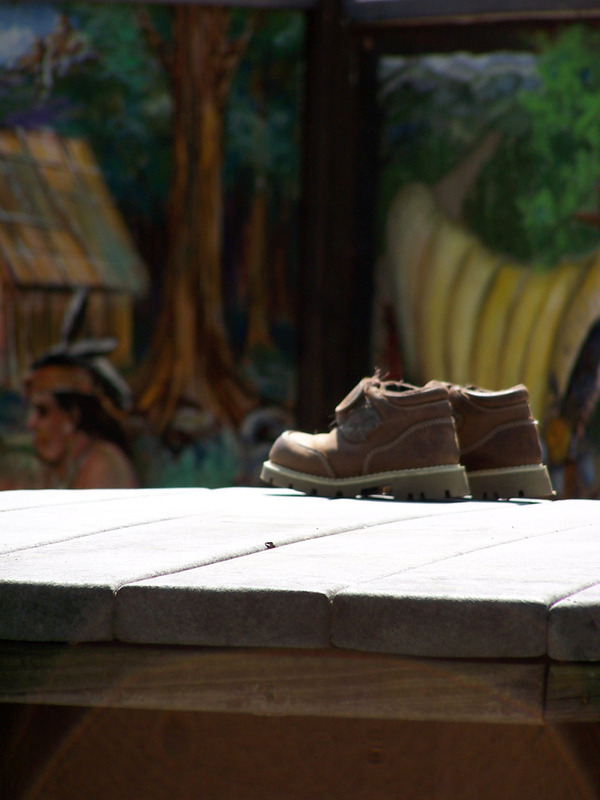 Haven’t read your story yet, it’s great how a pair of boots can inspire two similar stories. Thanks for reading. My father died far too young and I still miss him so much. He taught me a great deal and it would have been nice to have him see how it all worked out. My father was killed in an accident when I was 10. I can really relate to that sense of longing, and wishing it could have been longer. And yes, the stories really are so interesting! I was inspired to write another this week… two VERY different stories. My first is similar to yours, the 2nd, not at all! So sorry to hear you lost your father when you were so young, must have been a very difficult time for you and your family. Yes, it was. Thanks. But it sounds like you lost yours much sooner than you should have, and pain is pain… It’s a hard loss. Dee, I loved the story as well as the video. Both were just beautiful. Thank you Jan, pleased you liked both the story and the video. The Lake District is a beautiful place, I’m a huge fan, just like dad was. As you know from a previous post, my father died at home. I still miss him. What a beautiful tribute to your dad. I think I do hear him laughing. Lovely piece of writing. I’m glad you liked my story; those boots just reminded me of his walks and the way he would just take off. He was a great person, but then I’m biased! Wonderful memories, Dee. I enjoyed reading this. Thank you for reading, so pleased you enjoyed it. Thanks for reading, I appreciate your comments and they fit him well. Lovely memories of your dad. Although my Pa died 20 years ago I still see him sometimes and still miss him. Thank you Liz. Understand how you feel, thank you for sharing your thoughts. A lovely memorial, I found it very touching. Thank you Kerriann, lovely to hear from you.